The neighborhood with pedestrian walkway icts streets in the very fashionable 'Le Marais' area classic beauty and elegance combined with eclectic shopping, lively pubs (bars) and up-market restaurants - something for every taste. At your doorstep is the Hotel de Ville metro stop with Direct access to the Champs Elysees, Arch of Triumph, Concorde Square, the Defense and the Gare de Lyon. Or 5 minutes dans l'autre management is the RER station at St-Michel-Notre-Dame with Direct access to Charles de Gaulle and Orly airports Versailles Castle, Disneyland. apartment located in the 4th district on 'instead of City Hall. " stunning views of the city hall and Notre Dame. the marshes, the halls and the cathedral Notre Dame are nearby, as well as many museums, such picasso, the Louvre or the Pompidou center. the pedestrian streets, with their cafes and famous restaurants, the great bhv store are within meters. at the foot of the building Metro Station City Hall 'directly serves the Champs Elysees, defense and Lyon station. the rer direct châtelet station with charles and Orly airports, is two minutes walk. Possibility of lease with the apartment next door (Ad # 685073) The meeting of these two apartments gives you the opportunity to occupancy up to 8 persons. The location of our apartment could not have been more convenient! 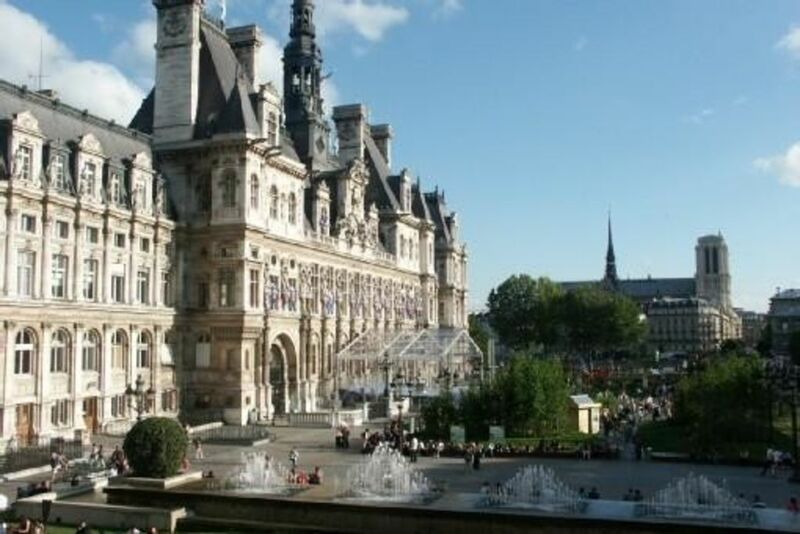 It is very central - 15 steps to the #1 metro line and directly across from the Hotel de Ville. We could see Notre Dame from our window! The apartment is furnished tastefully and is the right size for two. Nicely upgraded kitchen and bathroom and a very comfortable bed make spending time there a pleasure. The owner does his best to answer all questions and is readily available should help be necessary. Getting our luggage up the two flights of stairs was the most difficult part and that only happened once! You are right in the center of things at this rental which overlooks the Hotel de Ville. Notre Dame is visible in the distance. If you wish to use the metro, a stop on the #1 line is steps away. The furnishings provide a bit of charm and the layout provides a bit more room than one might expect from a studio. The large modern bathroom and plush bathrobes are lovely. The kitchen could be improved by eliminating some of the appliances. Three coffee pots is unnecessary. But, assuming you’ll sampling Paris restaurants most nights, you’ll find what you need in the tiny kitchen. We were sorry not to meet our hosts. Maybe next time. The property is very clean and centrally located to everything. I love staying here. The owners are lovely people. It was my third time staying there and when back in Paris it is where I will choose to stay again. There’s a small basket of goodies (wine, jams,etc.) upon arrival. The bath towels and robes are luxurious. There’s an expresso machine built in that makes the best coffee and lattes. The building where the apartment is located is very innocuous from the outside but once you are in the apartment it has all the charm you could hope for in a Paris apartment. Thanks Jean-Michel and Nicole. I hope to see you both again on my next stay in Paris. I have just had a wonderful 5 week holiday in this lovely apartment. As other reviewers have said, it is just like the photos, particularly well appointed and in a excellent location. Jean-Michel is an excellent host. He responded quickly to my emails making the booking process easy, his arrival instructions were very clear, he checked that I had arrived and called in several times to make sure everything was OK. I am confident that if I had had a problem unrelated to the apartment, Jean-Michel would have helped. For me, a single female, it is important that I felt secure in the apartment and that the building was in an area that I felt safe walking in at night. I will certainly try to return. We stayed 10 nights in this apartment in late January. Jean-Michel welcomed us upon arrival and gave us a thorough orientation of the apartment and the surrounding area. We used the metro and city buses to get around Paris and both were just steps from our door. The view from the windows perfectly framed the Hotel DeVille and Notre Dame. We enjoyed a delicious dinner at L'Acanthe at 22 rue Saint Martin just a few blocks from the apartment. Jean-Michel made the arrangements easy and helped us with our transportation needs. We would definitely stay here again on our next trip to Paris. Le Marais is my favourite area of Paris and the apartment's location across from the Hotel de Ville with a view of Notre Dame was ideal for exploring. Jean-Michel kindly dropped by to ensure all our requirements were met. The thought that has gone into setting up the apartment for an exceptional stay didn't go unnoticed and I would certainly book the apartment again when returning to Paris. Thank you Jean-Michel. The RER station Chatelet, qui is A Few minutes' walk away, a process Provides Direct link to Charles de Gaulle and Orly Airports.